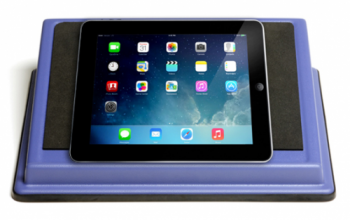 The iSlope is a strong, lightweight, and robust tablet stand allowing an iPad and other similar tablet devices to be supported at a suitable angle for easy use, and to aid in the correct positioning of a user's posture. iSlope features a non-slip surface and base to allow for safe use whilst holding the device in position. The design is also of a suitable size to accommodate an iPad Big Grips or other protective cases. Angled design to encourage a user's correct posture. Large enough to fit a Big Grips protective case.